CBOX OpenLab admins can control who can become a member by whitelisting email domains. You can add one or more domain names, and you can use wildcards (“*”) to broaden the list of permitted users. If you leave the whitelist blank, users from all email domains will be permitted to register. If you want to limit registrations to only people from your institution, you will want to whitelist the email domain from your institution. The wildcard option makes it easier if, for example, your institution has subdomains, e.g. green.myinstitution.edu and blue.myinstitution.edu. To allow both of these subdomains, you would use *.myinstitution.edu. CBOX OpenLab admins can also create Sign Up Codes to control who is able to sign up for an account as particular member type. 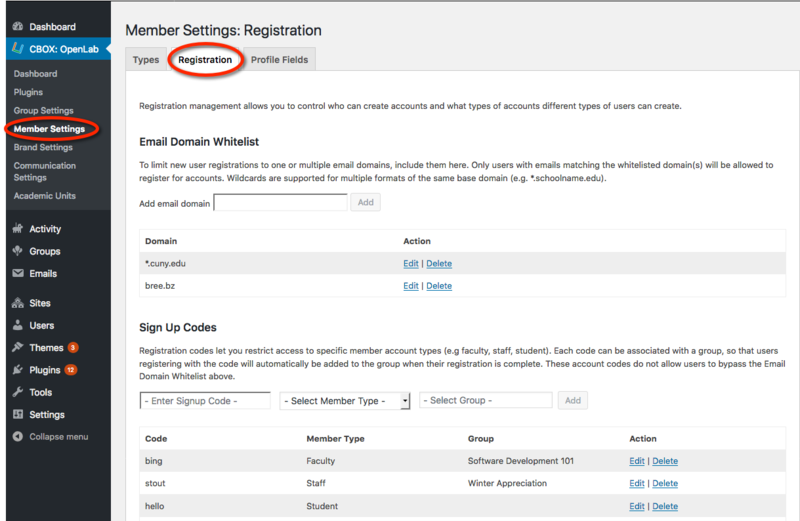 For example, you may want to create a sign-up code for faculty and staff so that students and alumni could sign up for accounts without a code, but anyone who wanted to create a faculty or staff account would need the appropriate code.